9 September 2008, at 11:04a.m. 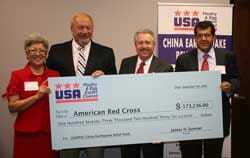 US - Members of the USA Poultry & Egg Export Council (USAPEEC) presented a check in the amount of $173,236 to the American Red Cross (ARC) to be used to aid victims of the recent devastating earthquakes in the Sichuan province in China. Representatives of several USAPEEC member companies joined President Jim Sumner at the council's offices in presenting the check to Tim English, CEO of the Atlanta chapter of the ARC. Soon after the earthquakes struck China in May, USAPEEC established a fund to collect donations from its members. The organization also contributed $100,000 to the cause. Other USAPEEC member companies donated more than $90,000 directly to relief organizations to aid victims of the quakes, which killed more than 70,000 people and injured thousands more. Mr Sumner said that USAPEEC, which has offices in Beijing, Shanghai and Hong Kong, has developed a good relationship with China over the years. "China is the second-leading export market for US poultry," he said. "Many of our members who have done business there for years have formed lasting friendships with the Chinese people. They were truly moved by this tragedy, and when we announced this fund, donations began coming in almost immediately. We hope this donation will in some small way help those in need." Saher Rizk of Mirasco, who serves as chairman of USAPEEC, read a letter from Chinese Ambassador to the US Zhou Wenzhong thanking the organization and its members for the donation. Lani Wong of Atlanta, who chairs the National Association of Chinese-Americans, praised the donation by USAPEEC members, saying that it would reinforce the bridges of friendship and cooperation that have been built between the U.S. and China. Nancy Quan-Sellers, who has been active in the Chinese-American community in Atlanta for many years, also attended the presentation. Others who attended the ceremony were Mike Giles, executive director of the Georgia Poultry Federation; David Bryant and Maggie Adamack of the Georgia Department of Agriculture; and Mary Waters of the Georgia Department of Economic Development. The following donating companies were represented at the presentation: AJC International, DGM Commodities, Fieldale Farms, Grove Services, Intervision Foods, and Mar-Jac Poultry. Other US poultry exporting companies that donated to either the USAPEEC fund or directly to relief agencies are Interra International, Keystone Foods, Lamex Foods, MetaFoods, Mountaire Farms, Peco Foods, Pilgrim's Pride, Sanderson Farms, Simmons Foods, Case Farms, Henningsen Foods, Sellari Enterprises, Radlo Foods, Marine Cargo Inspection Group, Urner Barry Publications, China Agri Corp., Parker International, and OK Foods.